This disease is very easy to treat by purchasing a proprietary remedie from an aquatic stockist. The fish becomes covered with tiny white spots but don't get this confused with the white turbercles seen on the gill covers of male Goldfishes in the breeding season. This is not a disease, but an indication that something is wrong with the water. If this happens don't increase the amount of oxygenating plants as this will only increase the amount of carbon dioxide during the hours of darkness. To fix the problem increase the aeration and water turbulence at the water surface level. This is an easy disease to diagnose but can be difficult to cure. 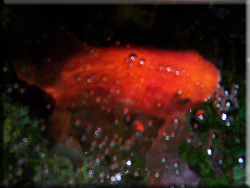 The body of the fish becomes very swollen due to liquid accumilating in the body cavities. Treatment from aquatic stockist can be purchased. This can either be an outbreak of cotton-wool tufts over the body, or as an overall covering of a cobweb-like substance. Treatment from aquatic stockist can be purchased.